One of the most common requirements on a job posting is “Excellent communication skills”. The hope is that if you hire people with these excellent communication skills, you’ll avoid all the confusion, distrust, mistakes and anxiety that arises when people fail to communicate openly and clearly. Unfortunately, it’s hard to evaluate how well someone’s excellent communication skills will perform on an ongoing basis in the short interview process. And no amount of excellent skills can overcome cultural habits that discourage questions and complaints, layers of management that keep people in the dark, or managers who don't know how to truly listen to what people tell them. Timothy Gallwey, author of The Inner Game of Work observed that anytime we are not at our best, there is usually a thought in the way. If you follow sports, think about what the opposing team does if there is a critical foul shot or field goal to be made at the end of the game. The opposing coach calls time out—trying to give the athlete enough time to think about it—to allow a non-supportive thought to get in the way. Is there anything at all about which you are curious, wondering, anxious, or concerned? At University of Chicago, psychological scientists found that students who jotted down their worries ten minutes before tests avoided choking and performed markedly better. The idea is to clear the working memory—sort of a mental scratch pad in the brain—of worries that interfere with the cognitive resources needed for the task at hand. Clearing jitters before a test can improve the grade. From an organizational perspective, it is important to continually give people permission to “clear”—to ask about anything. Think about it this way—given a void in information, people will make something up to fill the void. Transparency can never be achieved unless people have the permission and safety to ask about everything. Without this freedom, they will be left with just “not knowing” or listening to rumors. People worry and anything you can do to provide clarity is beneficial. One of my favorite ideas is: In order to deal with change, people need clarity not certainty. Most managers make the mistake of waiting for certainty before communicating with their people. Too late! Talk to your people before you know how it's all going to turn out. You can always tell them what you know right now, the process being followed, and when you will know more. That clarity will go a long way towards reducing the angst in the organization. Effective supervisors routinely remind people that it’s okay to ask about anything. Then they reinforce this by once a month devoting 30-40 minutes to clear their group deliberately. Here is another version of the clearing question, one more focused on worries. What’s going on in your unit, the College, the University (or beyond) that you are curious, wondering, concerned, or upset about? At times, life stops working the way we want it to. Each of us has had complaints about a supervisor, our colleagues, or even family members. Good, loyal people complain. In the work setting, good managers create an environment in which people feel safe to question, speak up, and, yes, even complain. 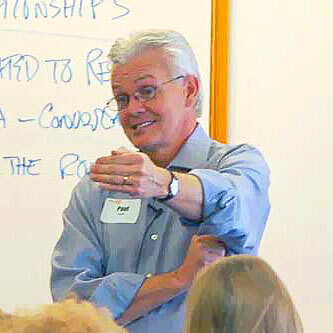 In fact, people who are willing to speak up about something that is not working for them are a gift to the organization. If you become aware of a problem, you can do something about it—no awareness—no access to resolving. The key idea here is that behind every complaint is a request. The task is to hear people out, then ask what they want—what is the request at the heart of the issue they’re complaining about? Nothing seemed to happen as a result of the last employee survey. I know you want our input, but spending all this time on the survey seems like a waste of time. We would appreciate knowing the process for working with the results of the survey and getting a specific list of actions you intend to take as a result. If people can clearly state a concern or complaint and ask for what they feel will resolve it, then you can begin to address the issue. Being able to listen and respond to complaints is a critical skill for supervisors— actually for anyone going through life! Here are some reminders for when you respond to complaints. People take things personally, so go gently. Be supportive, even if the complaint seems unfounded or petty. Don’t take the complaint personally or resist what they’re saying. Don’t justify or explain unless you are asked for an explanation. 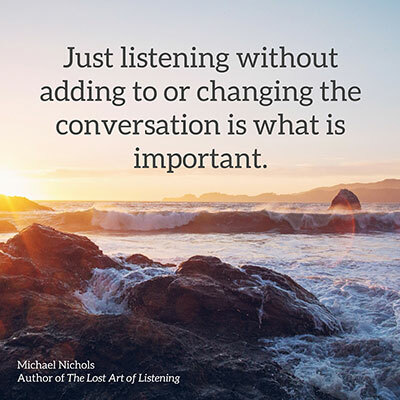 Go slowly (speak, listen, then listen some more) and trust that the conversation will work out. Surfacing and working through questions and complaints is key to growing and sustaining a great organization (or personal relationship). While clearing questions and dealing with complaints are two separate processes, this template covers both since often a discussion will surface each equally. Any supervisor, manager, or leader that wants people at their best must cultivate a practice of allowing people to express anything and everything that might be of concern. Use of this protocol over time will help create a culture of openness and safety. View the template details and share your feedback. 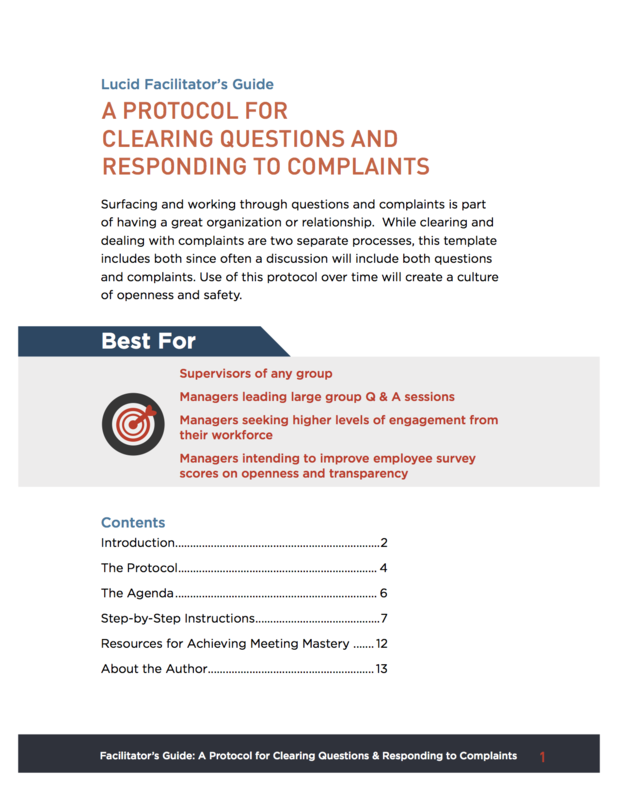 What works for clearing questions and handling complaints in your organization? Paul is the author of multiple books, including Meetings Matter: 8 Powerful Strategies for Remarkable Conversations, Being Remarkable, and Ten Powerful Things to Say to Your Kids. He can be reached at www.paulaxtell.com and via email at paulaxtell@mac.com.